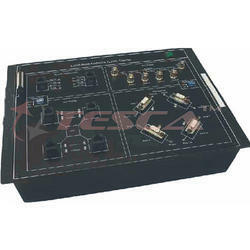 Manufacturer of a wide range of products which include logic analyzer, variable binary data generator, modulation & demodulation trainer, transmission line trainer, analog signal sampling & reconstruction trainer and fdm trainer. very useful for educational institutions, industries and R & D labs. 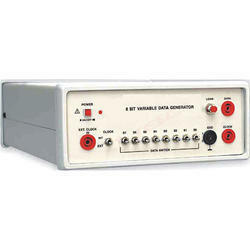 standard features and performance of the stand alone and expensive logic analyzers. Being a cost effective tool it also provides high speed clock rates, deep data buffers, sophisticated triggering, solid reliability etc. 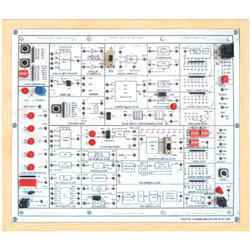 Experimental Training Board has been designed specifically for the study of Pulse Amplitude Modulation & Demodulation. 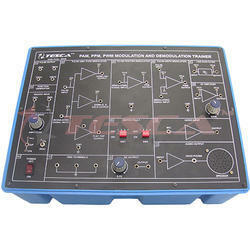 Using this training board one can know the specialized techniques of Pulse Amplitude Modulation and Demodulation. To demonstrate sampling of a sine wave audio signal thereby converting it into Pulse Amplitude Modulated Signal (PAM). 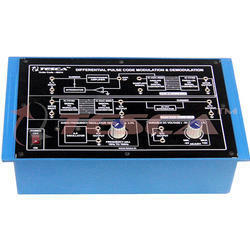 To demonstrate demodulation of PAM signal thereby recovering the sine wave audio signal. To demonstrate the effect of sampling-rate on the distortion in recovered sine wave audio signal. Experimental Training Board has been designed specifically for the study of frequency shift keying modulation and Demodulation. The board is absolutely self contained and requires only CRO. 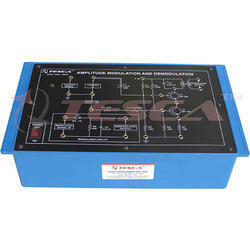 To study the generation of the Frequency Shift Keyed output and also to demodulate the FSK output. Experimental Training Board has been designed specifically for the study the Phase shift keying modulation and Demodulation. The board is absolutely self contained and requires only CRO. 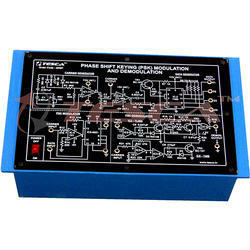 To study the generation of the Phase Shift Keyed output and also to demodulate the PSK output. Experimental Training Board has been designed specifically for the study of Amplitude shift key modulation and Demodulation. The board is absolutely self contained and requires only CRO. To study the generation of the Amplitude Shift Key output and also to demodulate the ASK output. +- 12V D.C. at 50mA, IC regulated power supply internally connected. +- 5V D.C. at 50mA, IC regulated power supply internally connected. Clock Generator 200Hz to 15KHz. Logic Selection switches for high / low (9Nos). Binary Counter (Divided by 16 counter). Carrier Signal Generator 4 to 10KHz. Amplitude Shift Key (ASK) Modulator. Amplitude Shift Key (ASK) Demodulator. 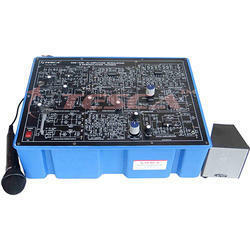 Experimental Training Board has been designed specifically for study of delta modulation and demodulation The board is absolutely self contained and requires only CRO. To study delta modulation and demodulation. 5V D.C. at 100mA IC regulated power supply internally connected. +-12V D.C. at 100mA IC regulated power supply internally connected. Digital to Analog convertor DAC IC. Quad two input NAND gate IC. Experimental Training Board has been designed specifically to study Pulse Code Modulation & Demodulation. In the basic PCM Modulator the base band analog signal is covered into 8 bit digital format using an ADC. The sampling rate is set at 2.5 KHz. The 8 bit parallel data from ADC is converted into serial bit stream at 33 kbps. The PCM Demodulator receives the serial data, converts it into 8 bit parallel format. 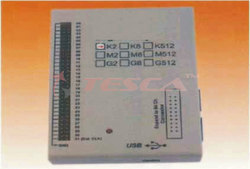 The Analog to digital converter transforms the 8 bit parallel data into analog level. Thus the output of DAC is a stepped approximation of input signal. 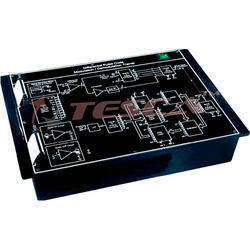 A low pass filter is used to recover the analog signal. Practical experience on this board carries great educative value for Science and Engineering Students. 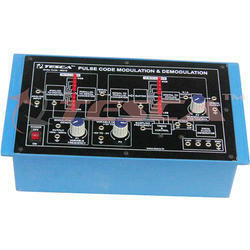 To study Pulse Code Modulation & Demodulation. +- 15V D.C. at 100mA IC regulated power supply internally connected. + 5V D.C. to -9V Variable D.C. output. Built in TTL Clock Generator 33 KHz. 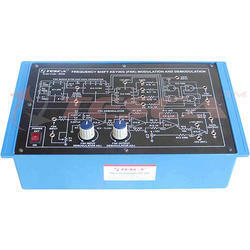 Modulating Signal Generator 15Hz to 300Hz. Experimental Training Board has been designed specifically to study of Sampling Theorem using Pulse Amplitude Modulation and Demodulation. The training board is complete in all respect except C.R.O. Practical experience on this set up carries great educative value for Science and Engineering Students. To study Sampling Theorem using Pulse Amplitude Modulation and Demodulation. To generate PAM signal by modulating with audio signal by natural sampling. To generate PAM signal by modulating with audio signal by Flat-Top sampling. To generate PAM signal by modulating with audio signal by Sample / Hold circuit. To demodulate using Low Pass Filter to reconstruct input(sine wave). 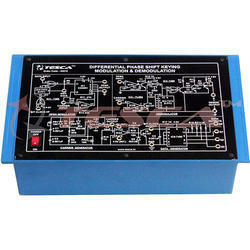 +-15V D.C. at 100mA, IC Regulated Power Supply. 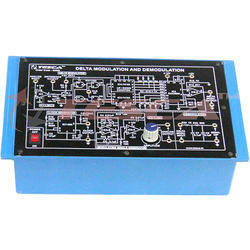 +5V D.C. at 100mA, IC Regulated Power Supply. A.F. 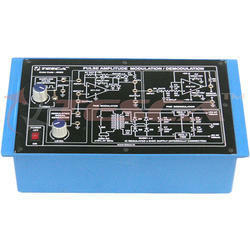 signal generator for modulating signal. 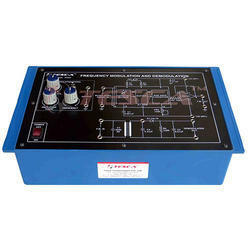 Sampling clock generator to provide sampling clock and gate pulse. Modulator circuit for Flat-top natural and S/H circuit. Demodulator circuit to reconstruct input (sinewave). 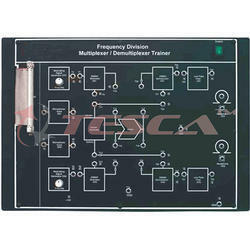 Experimental Training Board has been designed specifically to study Differential Pulse Code Modulation & Demodulation. In the basic DPCM Modulator the base band analog signal is covered into 8 bit digital format using an ADC. The sampling rate is set at 2.5 Khz. The DPCM Demodulator receives the serial data, converts it into 8 bit parallel format. The Digital to Analog converter transforms the 8 bit parallel data into analog level. Thus the output of DAC is a stepped approximation of input signal. A low pass filter is used to recover the analog signal. To study Differential Pulse Code Modulation & Demodulation. +- 12V D.C. at 100mA IC regulated power supply internally connected. - 5V D.C. to + 5V D.C. Variable D.C. output. Audio Frequency Oscillator 10Hz to 100Hz for modulation. 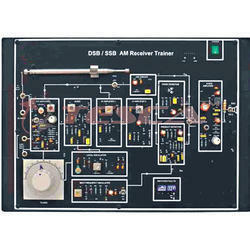 Experimental Training Board has been designed specifically to study Differential Phase Shift Keying (DPSK) Modulation and Demodulation. Practical experience on this board carries great educative value for Science and Engineering Students. The unit is absolutely self contained except CRO. To study Differential Phase Shift Keying Modulation and Demodulation. +- 5V D.C. at 100mA IC regulated Power Supply internally connected. IC-1 for generating DPSK (Differential Phase Shift Keying) signal. IC-5 for generating Carrier signals. IC-2A for generating Bit Clock. IC-6 for generating different Datas. 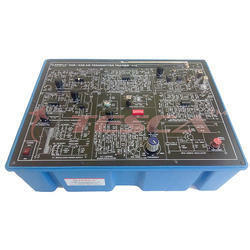 IC-2 B & C, IC-3 C & D, IC-4 D-FF2 and Transistor 2, 3 & 4 are used as Demodulator. Frequency Modulation via varactor / reactance Modulation. Frequency Demodulation via Detuned Resonant / Ratio / Qudrature / Foster - Seeley / Phase locked loop detector. Separate VCO circuit to demonstrate FM waveform. FDM trainer demonstrates FDM technique. 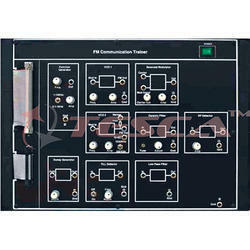 Two different modulated inputs can be transmitted as a single communication line using FDM The trainer is self contained and all the inputs are on board. PAM-PPM-PWM are the basic Pulse Modulation techniques. The trainer provides complete set up to the students for performing experiments on these techniques. They can study Sampling, Pulse Modulation, Demodulation & Signal reconstruction process. Separate circuits are provided for each technique. The Operating Manual provides technology details and procedure to perform the experiments. 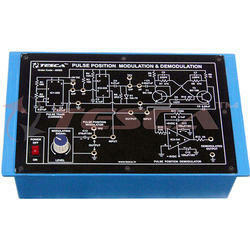 Experimental Training Board has been designed specifically for the study of Pulse Position Modulation and Demodulation. Using this training board one can know the specialized techniques of Pulse Position Modulation and Demodulation. 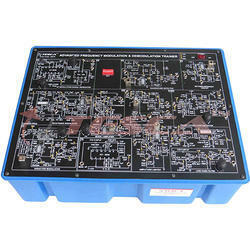 Experimental Training Board has been designed specifically for the study of Amplitude Modulation and Demodulation. 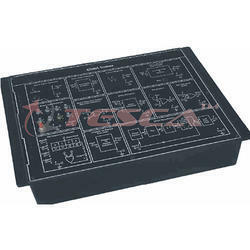 This training board is based on latest solid state circuits for generating modulating signal, Amplitude Modulation and Demodulation. Practical experience on this board carries great educative value for Science and Engineering Students. 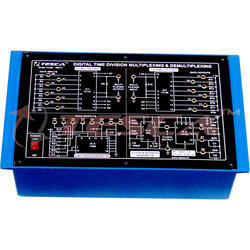 Experimental Training Board has been designed specifically for the study of Frequency Modulation and Demodulation. To demodulate the F.M. singal and observe the output on C.R.O. 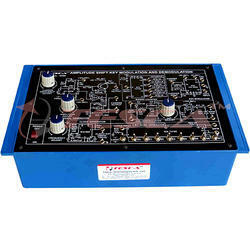 Experimental Training Board has been designed specifically to study Digital time division multiplexing & demultiplexing. 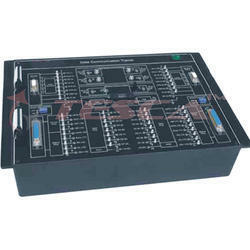 8 channel Digital Multiplexer and Demultiplexer are provided on the Trainer. A rolling Address Generator scans the 8 channels sequentially. Data Generator with 8 different outputs act as signal sources for the 8 channels. To study Digital Time Division Multiplexing & Demultiplexing. DSB/SSB-SC Amplitude Modulation & Demodulation Trainer has been designed with a view to provide practical and experimental knowledge of Amplitude Modulation / Demodulation technique as practically implemented in Analog Communication system on a SINGLE P.C.B. of size 300x400mm. Generate voice signal AM modulation and demodulation using Mic. 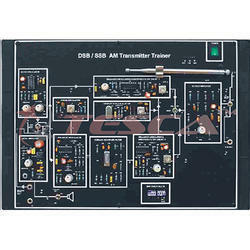 This trainer has been designed with a view to provide practical and experimental knowledge of DSB / SSB AM Transmitter technique as practically implemented in Analog Communication system on a signal P.C.B. of size 300x400mm. Study of carrier frequency generation. Study of DSB / SSB AM Generation & Transmission. Study of Transmitter tuned circuits. Study of DSB & SSB AM reception & deletion by diode / product detectors. Study of receiver tuned circuits. Study of Sensitivity, Selectivity & Fidelity of Receiver. Study of double sideband AM reception using envelope detector via cable. Study of double sideband AM reception using envelope detector via Antenna. Study of sensitivity, selectivity, of a radio receiver. Study of single sideband AM reception using product detector. Voice transmission with DSB AM transmission / reception.uency generation. Signal Attenuation Network : Adjustable from 0 to the maximum of input value. DPCM Trainer is a manifestation of our increasing efforts to present the modern technology in a best way to the people who want to unfold the mysteries behind the ever increasing communication super highway. 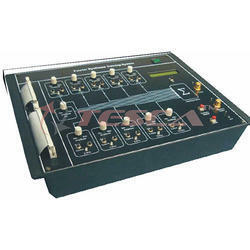 To present it in a best way the trainer incorporates the practical operating frequencies for sampling, audio processing and data processing which are commonly used in our public telephone networks. Onboard DPCM Transmitter and receiver. Onboard Audio input processing circuit. Onboard audio output processing circuit. Clock and entire control Signal section. Detailed signal processing circuit with complete data and control signal flow. A Pseudo-random Noise (PN) sequence is a sequence of binary numbers, e.g. +-1, which appears to be random; but is in fact perfectly deterministic. The sequence appears to be random in the sense that the binary values and groups or runs of the same binary value occur in the sequence in the same proportion they would if the sequence were being generated based on a fair "coin tossing" experiment. In the experiment, each head could result in one binary value and a tail the other value. The PN sequence appears to have been generated from such an experiment. 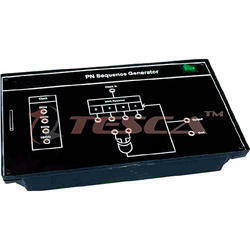 A software or hardware device designed to produce a PN sequence is called a PN generator. 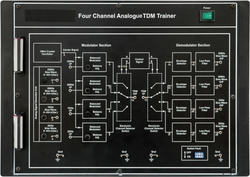 The Four channel analog TDM trainer demonstrate Time division multiplexing technique. 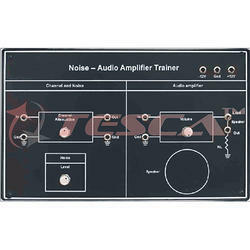 The trainer provides all necessary inputs and connections for students to study amplitude modulation, demodulation, multiplexing and demultiplexing techniques. The trainer is student friendly & completely self contained, having all the basic required circuits and controls on board. 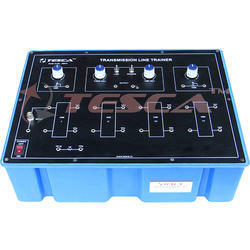 Student troubleshooting work is included through switched faults in the trainer. To study pseudo random bit sequence generation. Measures actual bit errors while a known PRBS-11 pseudorandom test sequence is being transmitted. 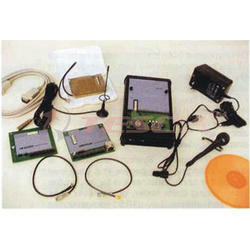 The GSM Trainer is a modem or mobile equipment for transmission of voice and data calls as well as SMS (Short Message Service) in GSM Network. To control the GSM modem there is an advanced set of AT commands according to GSM ETSI (European Telecommunications Standards Institute) 07.07 and 07.05 implemented. The GSM standard has established itself across continents. The trainer is well suited for studying AT commands by camping to real networks using SIM card. The GSM module (Global System for Mobile communication F 35 is a mobile station for transmission of voice and data calls as well as (SMS - Short Message Service) in GSM Network. To control the GSM module there is an advanced set of AT commands according to GSM ETSI (European Telecommunications Standards Institute) 07.07 and 07.05 implemented. Modem utilizes the GSM standard for cellular technology. The GSM standard has been established for use in the European community and elsewhere. 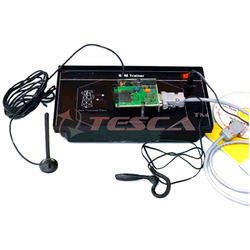 GSM modem is actually a low power radio transmitter and receiver. It sends out and receivers radio frequency energy. When modem is used the cellular system handling calls control both the radio frequency and the power level of cellular modem. Data Communications and Networking are one of the fastest growing segments today. The major reason for this growth is the dramatic increase in Networked offices, PC based products and internet users. More Students are taking courses to learn about them. Designed to assist students and practitioners to understand the various methods of exchange of data between two devices. It is designed to be user friendly and it supports self learning through the flexibility of making the connections by the user itself. For proper understanding of various protocols in serial and parallel communication, various experiments can be performed. In depth knowledge of ports and its functional details can be studied with the use of the supporting software provided. Manuals and notes help the user to understand the major terminologies and theory related to Data Communication. Local Area Network (LAN) Trainer provides the understanding of all the fundamentals of networking. It helps the user to gain knowledge regarding all network layers, cable designing and building of complete network of computers. The user can understand and actually implement various topologies using different standards given by IEEE. Actual connections can be made in different topologies and data can be transferred. The user will understand the protocols, topologies used in networking, measurement of error rate, throughput and effect of errors on protocols. The versatile software provided with assist the user to observe the various effects and configurations on network along with the graphical representation. Communication. Three sets of onboard cabling setup for Ethernet. On board parallel port direct cable connection setup. On board serial port direct cable connection setup. A 10 mbps hub is provided onboard with the circuitry exposed. 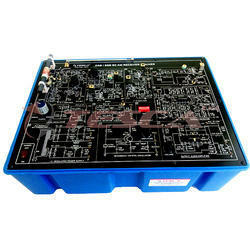 The power supply circuit for Hub is provided onboard. A separate Hub is also provides so to train students for multi Hub Networking. 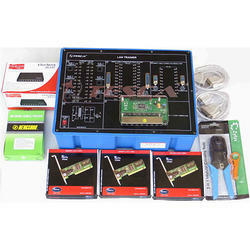 A set of 4 exhaustive manuals covering LAN hardware & cabling, software configurations protocols, terms & definitions. The trainer comes with a cable fabrication kit to provide hands on experience on real cabling. Modulators : Balanced Modulator with Band pass Filter (1 MHz) - 2 Nos. Balanced Modulator (455 KHz) - 1 No. Ceramic Bandpass Filter - 1 No. Fourier synthesis is a method of electronically constructing a signal with a specific, desired periodic waveform. It works by combining a sine wave signal and sine wave or cosine-wave harmonics (signals at multiples of the lowest, or fundamental, frequency) in certain proportions. The scheme gets its name from a French mathematician and physicist named Jean Baptiste Joseph Baron de Fourier, who lived during the 18th and 19th centuries. Unique VLSI based Fourier Synthesis trainer used to generate the waveform using harmonics. 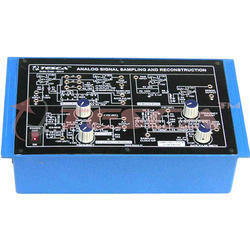 It is very useful in communication and DSP lab. Generation of standard time domain wave forms like Square, Sawtooth, Triangle, Half sine wave, Absolute value sine wave, Modulated waveform etc are possible with the help of this training system. Study of continuously variable slope detector modulation and demodulation. Study of pulse width modulation and demodulation.